YOUNG FRANKENSTEIN had a great run to enthusiastic audiences that was "electrified" every night. The critics agree that this was a wonderful production. 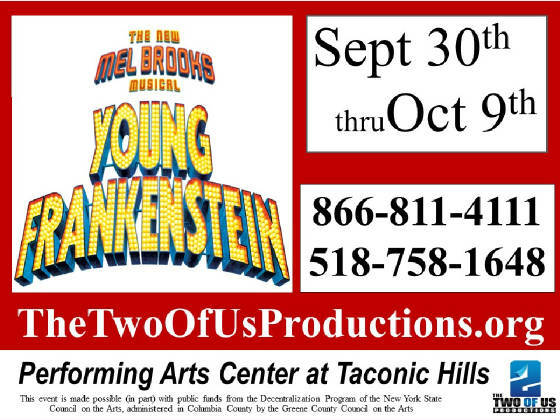 CRARYVILLE, NY --The Two Of Us Productions, the award winning theater company based in Columbia County NY, is pleased to present YOUNG FRANKENSTEIN, The Musical September 30th though October 9th, 2016 the well-equipped Performing Arts Center At Taconic Hills. This Broadway hit is based on this hit movie by Mel Brooks, with many of the iconic & audience pleasing movie scenes, all backed up by a full live orchestra that is the trademark of The Two Of Us Productions. Young Frankenstein, officially known as The New Mel Brooks Musical Young Frankenstein, is based on the 1974 comedy film of the same name written by Mel Brooks & Gene Wilder and directed by Brooks who has described it as his best film. It is a parody of the horror films of the 1930's, especially Universal Pictures adaption of Mary Shelly's Frankenstein and the sequel Son of Frankenstein. 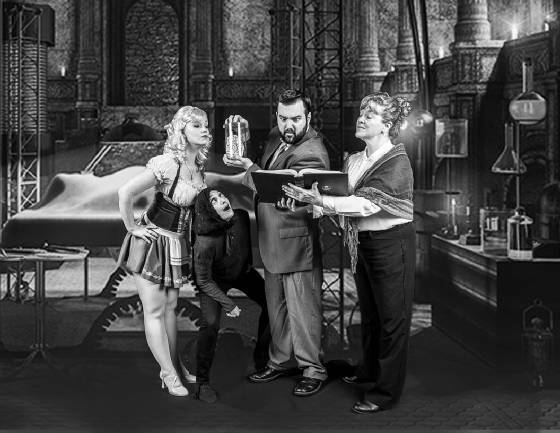 The Two of Us Productions is well known throughout the Hudson Valley for presenting quality theater, both musicals and dramas. Their recent productions of Chicago, Les Miserables, next to normal and Jesus Christ Superstar were all recognized by the Theatre Association of NY with multiple awards, including outstanding work by the company & outstanding performance by the orchestra. One of their trademarks is presenting musicals with full orchestras, a rarity that is a great treat for their audiences.